Having an out headlight or broken headlight on your car is never a fun or safe situation. Headlights help light the road and keep other drivers aware of where you are on the road. Not being able to see everything during times of limited visibility or at night can put you into a dangerous situation. On top of not having the ability to see everything on the road, you also run the risk of being pulled over by a law enforcement officer, which no one wants. No matter what is happening with your headlights, if you need a local mechanic who can help repair your headlights or replace a bulb… choose Mr. Muffler! They say that you should check your headlights once a year or more. Most of us never think about our headlights until we need them. Generally, the first thing we notice is that our lights seem a little dimmer or they start to flicker. Sure getting a full check over while you’re getting an oil change is nice, but an oil change shop can’t repair or replace a broken headlight. 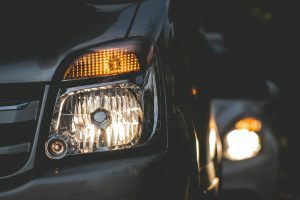 Make sure your headlights are clear before jumping the gun and buying a new headlight, sometimes the dim looking lights are simply because the headlights are dirty. Even if you are DIY’er or want to figure out how to replace the lightbulb in your headlight, save yourself the trouble and let us help. Why waste the money on a new blub if it’s the entire headlight that needs to be replaced? We can determine which is the problem before you have to blow through a few bulbs and your weekend time. Save yourself the stress and trouble of replacing a broken headlight, come into Mr. Muffler Westland and let the professionals handle it. Not only will you be getting our expertise, but also our 21 point inspection process. We’ll make sure your car’s headlights are good and ready to go! Get your appointment today for headlight and bulb replacement!